RunKeeper uses the GPS technology found in the iPhone to track your fitness activity, giving you comparable results to an expensive GPS watch at a fraction of the cost. Now, you can also enter your activities manually, including your treadmill runs too! The intuitive and easy-to-use interface of the app makes it easy to track how far you went, how long it took, what your pace/speed was, how many calories you burned, and the path you traveled on a map. 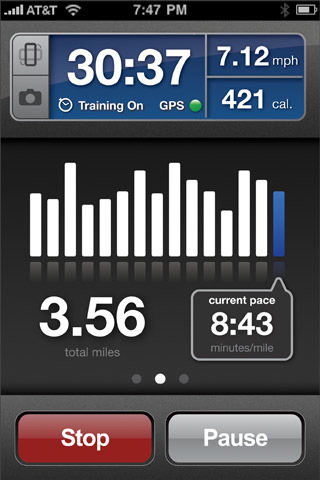 Once your activity is completed, the data is synced to the RunKeeper website (www.runkeeper.com) where you can view a history of all of your activities, and cumulative totals of all of your vital stats. You can also share your progress with friends by posting your activities to Facebook and Twitter, and creating a profile page that allows people to view all of your public activities.